Principles of Finance Featured: Boundless: Finance: "Chapter 3, Section 1: Standardizing Financial Statements"
Boundless: Finance: "Chapter 3, Section 1: Standardizing Financial Statements"
A standard balance sheet has three parts: assets, liabilities, and ownership equity; Asset = Liabilities + Equity. Detail the basics of a balance sheet. Of the four basic financial statements, the balance sheet is the only statement which applies to a single point in time of a business' calendar year. The main categories of assets are usually listed first (in order of liquidity) and are followed by the liabilities. The difference between the assets and the liabilities is known as "equity". Balance sheets can either be in the report form or the account form. A balance sheet is often presented alongside one for a different point in time (typically the previous year) for comparison. Guidelines for balance sheets of public business entities are given by the International Accounting Standards Board and numerous country-specific organizations/companies. A summary of a person's or organization's assets, liabilities and equity as of a specific date. In financial accounting, a balance sheet or statement of financial position is a summary of the financial balances of a sole proprietorship, a business partnership, acorporation or other business organization, such as an LLC or an LLP. Assets, liabilities and ownership equity are listed as of a specific date, such as the end of its financial year. A balance sheet is often described as a "snapshot of a company's financial condition. " Of the four basic financial statements, the balance sheet is the only statement which applies to a single point in time of a business' calendar year. A standard company balance sheet has three parts: assets, liabilities, and ownership equity. The main categories of assets are usually listed first, and typically in order of liquidity. Assets are followed by the liabilities. The difference between the assets and the liabilities is known as "equity. " Equity is the net assets or net worth of the capitalof the company. According to the accounting equation, net worth must equal assets minus liabilities. 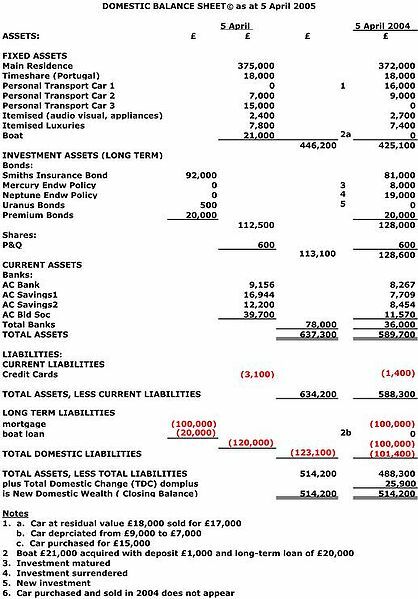 Balance sheet shows financial position of a company. A balance sheet summarizes an organization or individual's assets, equity, and liabilities at a specific point in time. We have two forms of balance sheet. They are the report form and the account form. Individuals and small businesses tend to have simple balance sheets. Larger businesses tend to have more complex balance sheets, and these are presented in the organization's annual report. Large businesses also may prepare balance sheets for segments of their businesses. A balance sheet is often presented alongside one for a different point in time (typically the previous year) for comparison. A personal balance sheet lists current assets, such as cash in checking accounts and savings accounts; long-term assets, such as common stock and real estate; current liabilities, such as loan debt and mortgage debt due; or long-term liabilities, such as mortgage and other loan debt. Securities and real estate values are listed at market value rather than at historical cost or cost basis. Personal net worth is the difference between an individual's total assets and total liabilities. A small business balance sheet lists current assets, such as cash, accounts receivable and inventory; fixed assets, such as land, buildings, and equipment; intangible assets, such as patents; and liabilities, such as accounts payable, accrued expenses, and long-term debt. Contingent liabilities, such as warranties, are noted in the footnotes to the balance sheet. The small business's equity is the difference between total assets and total liabilities. If applicable to the business, summary values for the following items should be included in the balance sheet: Assets are all the things the business owns, including property, tools, cars, etc. Investment property, such as real estate held for investment purposes. Financial assets (excluding investments accounted for using the equity method, accounts receivables, and cash and cash equivalents). Provisions for warranties or court decisions. Financial liabilities (excluding provisions and accounts payable), such as promissory notes and corporate bonds. Liabilities and assets for current tax. Deferred tax liabilities and deferred tax assets. Unearned revenue for services paid for by customers but not yet provided. Issued capital and reserves attributable to equity holders of the parent company (controlling interest). Numbers of shares authorized, issued and fully paid, and issued but not fully paid. Description of rights, preferences, and restrictions of shares. Treasury shares, including shares held by subsidiaries and associates. Shares reserved for issuance under options and contracts. Income statement is a company's financial statement that indicates how the revenue is transformed into the net income. Income statement displays the revenues recognized for a specific period, and the cost and expenses charged against these revenues, including write offs (e.g., depreciation and amortization of various assets) and taxes. The income statement can be prepared in one of two methods: The Single Step income statement and Multi-Step income statement. The income statement includes revenue, expenses, COGS, SG&A, depreciation, other revenues and expenses, finance costs, income tax expense, and net income. Intangible assets are defined as identifiable non-monetary assets that cannot be seen, touched, or physically measured, and are created through time and effort, and are identifiable as a separate asset. Income statement (also referred to as profit and loss statement [P&L]), revenue statement, a statement of financial performance, an earnings statement, an operating statement, or statement of operations) is a company's financial statement. This indicates how the revenue (money received from the sale of products and services before expenses are taken out, also known as the "top line") is transformed into the net income (the result after all revenues and expenses have been accounted for, also known as "Net Profit" or the "bottom line"). It displays the revenues recognized for a specific period, and the cost and expenses charged against these revenues, including write offs (e.g., depreciation and amortization of various assets) and taxes. The purpose of the income statement is to show managers and investors whether the company made or lost money during the period being reported. The Multi-Step income statement (as the name implies) takes several steps to find the bottom line, starting with the gross profit. It then calculates operating expenses and, when deducted from the gross profit, yields income from operations. Adding to income from operations is the difference of other revenues and other expenses. When combined with income from operations, this yields income before taxes. The final step is to deduct taxes, which finally produces the net income for the period measured. Cost of Goods Sold (COGS)/Cost of Sales - represents the direct costs attributable to goods produced and sold by a business (manufacturing or merchandizing). It includes material costs, direct labor, and overhead costs (as in absorption costing), and excludes operating costs (period costs), such as selling, administrative, advertising or R&D, etc. Selling expenses - represent expenses needed to sell products (e.g., salaries of sales people, commissions, and travel expenses; advertising; freight; shipping; depreciation of sales store buildings and equipment, etc.). General and Administrative (G&A) expenses - represent expenses to manage the business (salaries of officers/executives, legal and professional fees, utilities, insurance, depreciation of office building and equipment, office rents, office supplies, etc.). Depreciation/Amortization - the charge with respect to fixed assets/intangible assets that have been capitalized on the balance sheet for a specific (accounting) period. It is a systematic and rational allocation of cost rather than the recognition of market value decrement. Expenses recognized in the income statement should be analyzed either by nature (raw materials, transport costs, staffing costs, depreciation, employee benefit, etc.) or by function (cost of sales, selling, administrative, etc.). Other revenues or gains - revenues and gains from other than primary business activities (e.g., rent, income from patents). Finance costs - costs of borrowing from various creditors (e.g., interest expenses,bank charges). Income tax expense - sum of the amount of tax payable to tax authorities in the current reporting period (current tax liabilities/tax payable) and the amount of deferred tax liabilities (or assets). Irregular items - are reported separately because this way users can better predict future cash flows - irregular items most likely will not recur. These are reported net of taxes. Bottom line is the net income that is calculated after subtracting the expenses from revenue. Since this forms the last line of the income statement, it is informally called "bottom line. " It is important to investors as it represents the profit for the year attributable to the shareholders. ◄ Boundless: Finance: "Chapter 2, Section 6: Other Statements"